RX8 Project – Part 13, Canbus #3, Labview! These are something I hadn’t really come across until I started working on this project. While I was researching the work Noble had done developing their twin turbo engines I found the installation of piston cooling oil jets noted as one of the modifications undertaken. On the basis they found it was fine to use the stock pistons but did this mod I started doing research into what exactly they were and why they were used. The usage of these jets seems to be almost exclusively related to turbocharged engines, both diesel and petrol due to the amount of energy released in these engines. This increased release of energy caused by burning more fuel in pressurised air generates much higher temperatures inside the engine and while the block and head are actively cooled most normal engines rely on incidental oil spray to keep the piston cool. Once you start getting the piston considerably hotter you have a couple options. Either use a piston material which will cope with much higher temperatures without degrading (either due to the temperature affecting the material properties or due to thermal expansion) or somehow cool the piston. Various materials have been used for high performance pistons to help negate the material strength and thermal expansion problems with varying degrees of success but these are generally very expensive made to order parts and well beyond the range of most. This is where the jets come in. The jet is usually some sort of nozzle drilled into an oil gallery in the block which directs a stream of oil at the underside of each piston. This both cools and lubricates the piston and rod small end/pin. The basic problem of the original Noble method is that with such large drillings (probably about 4mm diameter) the cooling will be very effective because the flow rate will be high but the overall engine oil pressure will likely be very low, particularly around the main bearings because that is where they are drilled into the oil supply. Clearly the one place you don’t want low oil pressure! So me being me I decided to improve on the situation! Firstly I found that most cars that have these fitted (unsurprisingly) use considerably smaller jets, the best example I found was a NASCAR engine using a jet of 0.75mm (I have since tried to find this page again with no luck). Not wanting to risk trying to drill a hole of such a small diameter freehand at the bottom of the cylinder bore from the top I took a slightly different approach and started looking for suitable nozzle inserts that I could use that were available easily and cheap. After a lengthy search trying to find something intended for the purpose (from either a suitable production vehicle or something) I gave up and started just trying to work out what I actually needed and realised that with the rise of home 3D printing small nozzles were actually easy to get – specifically the extruder nozzles used on these printers. 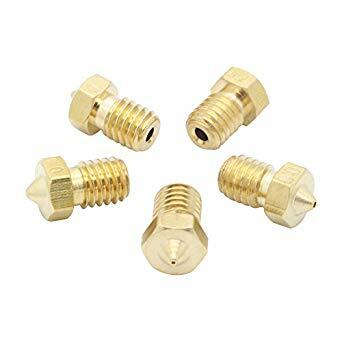 These nozzles are usually brass, have an M6 thread and are available in a range of hole sizes, for me the 0.8mm version looked like a good match. I bought a pack of four nozzles off eBay for a few pounds and decided I should see what sort of spray I actually got from them – I wanted them to produce a fine jet at the normal engine oil pressure rather than a mist as this would assure the oil reached the piston rather than most of it just hitting the inside of the cylinder bore which would achieve nothing. Because I’d decided on the M6 thread it made a test jig quite simple, just a normal M6 nut welded on the end of a bit of 12mm tube. When welding anything threaded it’s a good idea (particularly on smaller threads) to put a suitable mating part in to present distortion if you can. In this case I used a standard M6 bolt. After welding the nut the bolt can simply be unscrewed again but if you don’t do this the heat will often distort the thread enough that it is unusable after welding. The 12mm tube just happened to be about right for the nut but also a good size to allow a normal garden hose to fit over it. Water pressure in the UK is nominally about 3 Bar which is at least in about the right area to represent an oil pressure. Also there is the question of viscosity but my logic told me that oil being more viscous than water should not for a mist as easily, so if it worked with water oil should be fine. The test showed a solid jet out to about a meter from the nozzle and beyond that a tight stream of droplets another meter or so. This should certainly be good enough for what I need! After this test I decided to go for it, so I ordered another set of four nozzles and started trying to work out how to actually machine the block to make them fit. Due to the position the jets need to be installed the oil feeds need to be drilled from the crank bearing housing 60° either side of the centre line to match the cylinder bore angle and also at a slight angle forward or backward (depending on which cylinder it is) so they actually come out into the shoulder at the bottom of the bores rather than just continuing between the cylinders. First off I marked up the 60° line for each bore so I had something to line the drill up with for the angle and the starting point for the drilling. Next I found a drill bit that nicely fitted into the groove in the bearing housing so as to avoid reducing the supporting area for the bearing which as it turns out is a 3.2mm. This is the area that apparently will crack on the Noble engines – they use a significantly larger drill hole here which breaks into the bearing support lands and I suspect this is part of the issue but that’s purely speculation. There is also no issue with restricting the flow to the jets here because the jets are now significantly smaller than drilling. The next important thing is this involves drilling quite a long, narrow diameter hole through aluminium and that can be quite problematic! 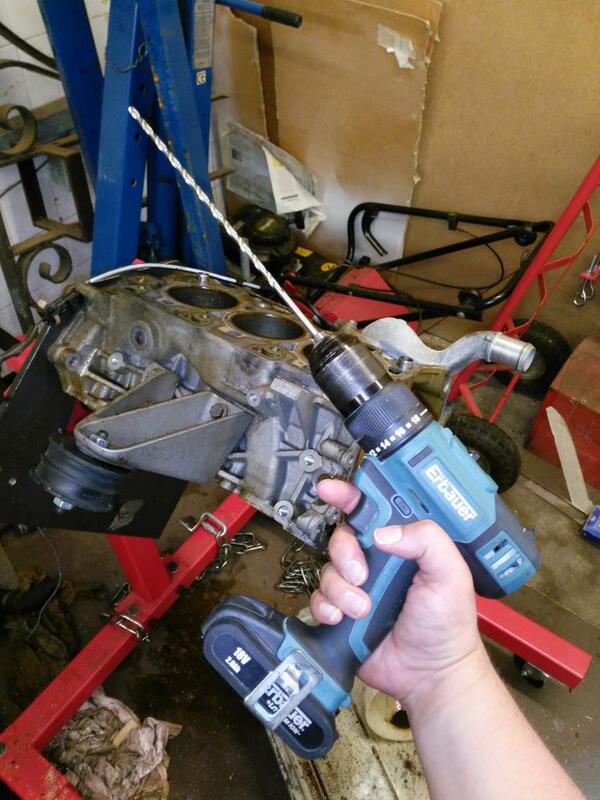 First off let me say this is next bit is a bad idea all round, you either have to be very confident in your abilities with a hand drill or not care if you ruin an engine block. Ideally you want to be both! If not you will want to talk to a machine shop to do this! Before you start remember to remove the bearing shell itself and put it somewhere safe! Aluminium is a soft material and will stick to drill bits and tend to generate heat due to friction, if it gets hot enough it can actually seize onto the drill bit causing it to break. Firstly a normal length 3.2mm drill won’t be long enough for this job, it will work to an extent but the flutes will eventually be covered by the sides of the drilled hole when you get deeper and there’s nowhere for the chips of aluminium to go. My advice is to buy a long series drill bit and use it. Start the hole with a normal bit because long bits are more flexible and can be harder to get and accurate start with but once you have a dimple that will hold the bit in place swap to the long series. Use plenty of lubricant (go on, guess how I found that out!). You can use WD40 but it can get quite expensive if you have a few holes to do as it tends to vaporise off during cutting. Thicker oils tend to protect the cutting edge more but make cutting slower but in this case aluminium is soft and so drills quickly anyway plus we’re only making a small hole so it will make little difference. Personally I used 3in1 on mine with works well and helps flush the chips out but you will need to reapply the oil to the hole regularly during the process to make sure the drill is well lubricated. You could also use engine oil or even gearbox oil but these would probably slow the process a little more. Go slowly and let the tool do the work, if you push too hard there is a serious risk of flexing the drill bit which at best will give you a hole that wanders and at worst a serious risk of snapping the drill bit. 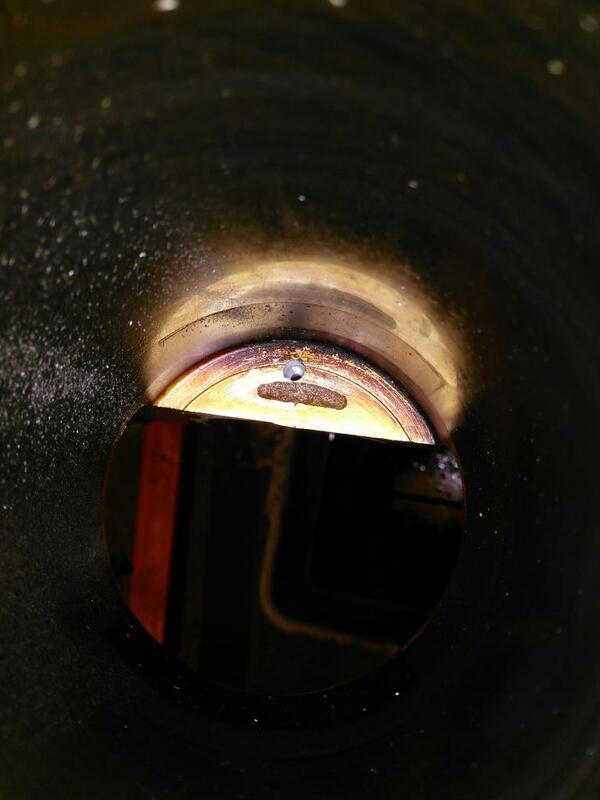 Once the 3.2mm hole comes through into the shoulder at the bottom of the bore we need to make the M6 nozzle fit, this means tapping a suitable thread into the bore end of the drilling. First clean out all the swarf (drilling debris) from the new hole. At this stage this is just to make sure we get a nice clean thread cut. Now we have the interesting bit, to tap M6 we need a 5mm pilot drill, so we have to drill out the cylinder end of the 3.2mm drilling to 5mm with enough depth for the nozzle to screw in but the only way to do this is to do it from the top of the bore with a really long drill! I went on eBay again and bought and extra long series 5mm drill for the job. This thing is 250mm long and looks absolutely ridiculous in a cordless hand drill. It actually looks more like it should be used on masonry but these have the normal tip and are actually for metal. If the one you buy has a flat ceramic insert in the tip you’ve bought the wrong one! I suggest you mark the depth you need to drill to accommodate the nozzle thread (with a little extra room for tapping) on the drill bit. The actual depth here isn’t critical as long as there’s enough depth for the nozzle threads at a minimum. Again plenty of lubricant and drill with slow speed and light pressure and be very careful to keep the drill loaded straight otherwise at best your hole will be at a funny angle but at worst you may snap the drill and damage the bore surface. Next clean the swarf out again so we can get a good thread tapped. Tapping the holes is another slightly awkward problem for the same reason as drilling the pilot hole, we need to do it from the top of the bore. I suggest going on eBay (or any of a thousand other places online) again and looking for an extra long ratchet tap wrench. These are available under any number of brands but I suspect they’re largely all from the same place. They are available in a small version, which is 250mm long and will tap M3-M10 or a large version which is 300mm long but taps M5-M12. I went for the smaller one because the smaller chuck should allow tapping tighter to the cylinder wall without damaging it and this is likely to be tight for this task. Expect this to be about £10. While you’re at it buy an M6x1 plug (bottoming) tap! Again proceed slowly with a well lubricated tap, many people will say you need to use proper cutting compound but for a small hole in a soft material this isn’t necessary, 3in1 will be fine. Try to cut forward a bit (maybe a turn at a time or so) and then back the tool off until you feel it turn smoothly. This will help prevent the tap from clogging up and either seizing up or damaging the new thread by material being forced against it. It may be necessary to back the tap out entirely to clean the removed metal from the threads because this is effectively a blind hole. Be careful not to keep going once the tap bottoms out. If you aren’t careful it’s comparatively easy to strip the threads in the aluminium with such a small tap and then it would be awkward to repair. If you’re not confident this really isn’t an ideal job for anyone new to tapping because it relies on having a degree of ‘feel’ about what you need to do and when to stop. Rinse and repeat five more times and congratulations you now have six neatly drilled and tapped jet positions! Before doing anything else clean everything again, I used a combination of brake clean, compressed air and a scribe. You need to make sure there is no swarf left in the drillings so you don’t risk that jet becoming clogged. Once clean you need to fit the jets. 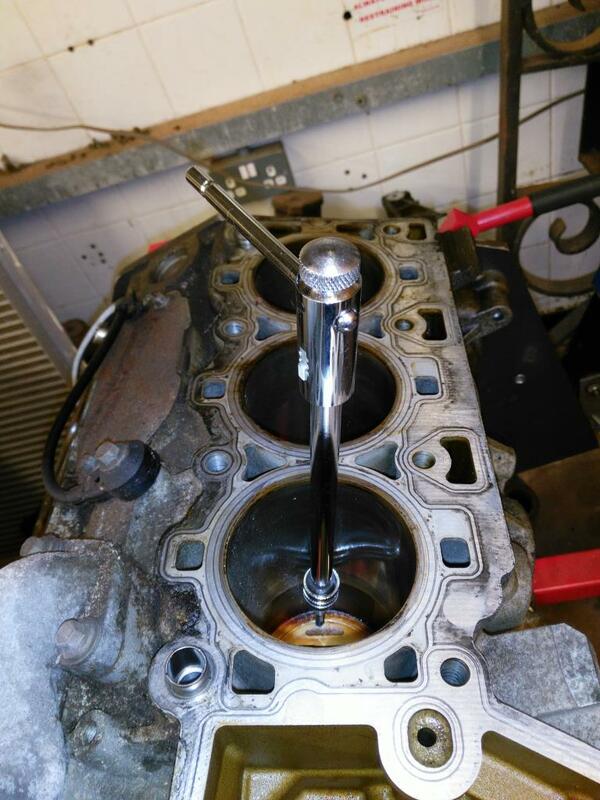 The jets I selected have an external hexagon and so can be tightened up with a socket wrench but you will need sufficient extension to reach the bottom of the cylinder bore with an appropriate sized socket. Clean all the jets with brake clean to degrease them – technically this is not necessary but it helps remove any other grime that has become stuck to the jets in manufacture/transit. Next I recommend you apply a small dab of a suitable thread locker to the jet threads, specifically I went for Loctite 243 which is a medium strength thread locker which will resist oil. 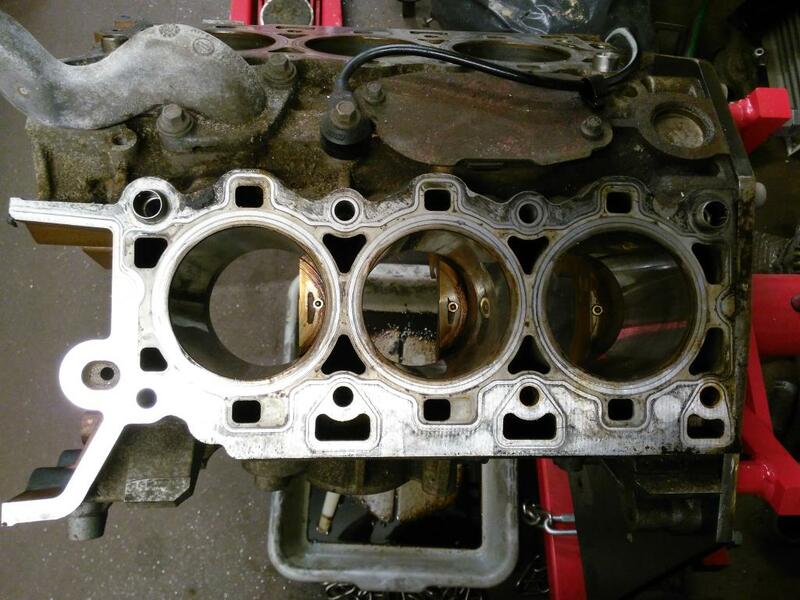 You can use others but if you go for anything stronger you’ll need a blowtorch to get it out and trying to do that down a cylinder bore could be interesting! 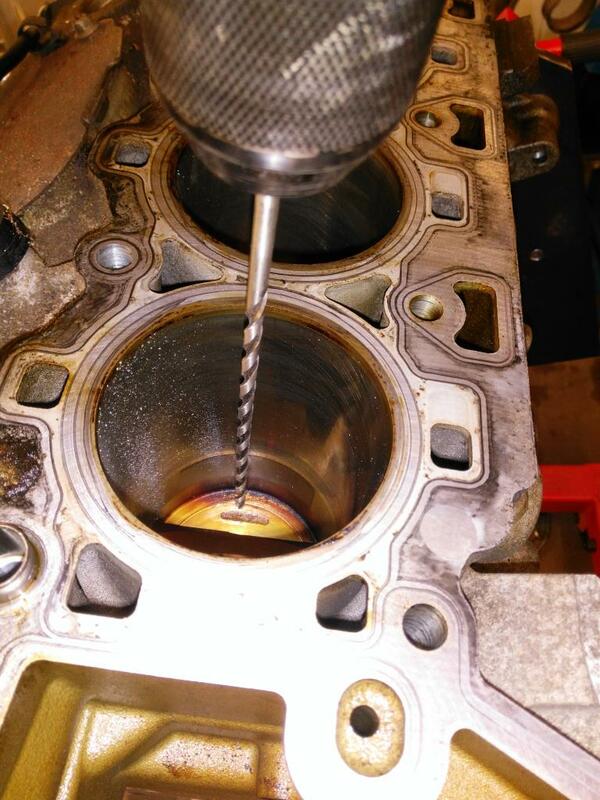 Once you have the dab of Loctite on the jet you need to screw it into the newly tapped hole – I found it easiest to do this carefully from the crank side of the block by fingertip but your mileage may vary! Once you have it in enough to keep it in place tighten it in with the socket wrench. The jets will only need to be nipped up for two important reasons; firstly they are thread locked and so will not vibrate loose and second they are small and made of brass so any more force will likely strip the hex. That’s it, one new set of shiny piston cooling oil jets! More on this project coming soon!